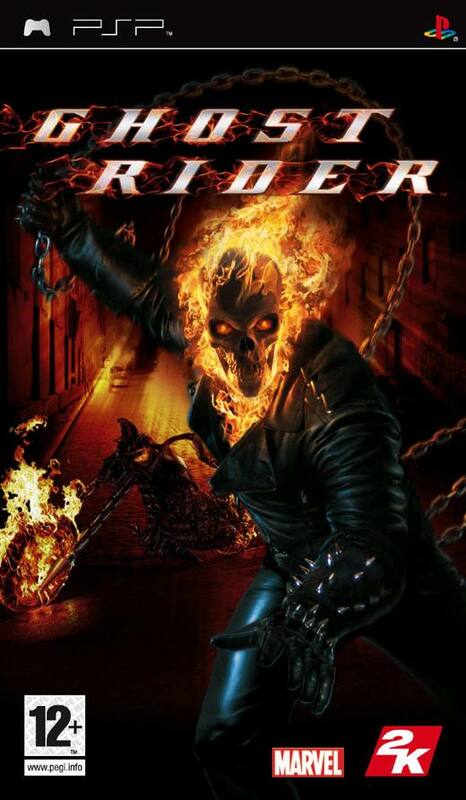 Almost coinciding with the movie release of Ghost Rider (15/02/07), the video game incarnation of the popular Marvel Comics character is also about to ride its way onto the PlayStation Portable and the PlayStation 2 which also promises similar thrills and entertainment. For those that are unaware of the Ghost Rider character, it follows the tale of a stuntman named Johnny Blaze who sold his soul in exchange for demonic powers. Unlike most movie franchise games, this title follows the official comic book and not the soon to be released Hollywood blockbuster. With that said, comic writers Garth Ennis and Jimmy Palmiotti have assisted in creating the storyline for this tale and for those that don't know who these writers are, they are easily two of the biggest shakers and movers in the comic industry. The gameplay of Ghost Rider is your classic arcade adventure game that is reminiscent of titles such as the Devil May Cry and Bloodrayne which throws in elements of the supernatural and the modern world in an attempt to draw the player into this rich and exciting gaming world. The PSP control system is almost perfect and the button uses have been well laid on the controller which ensures that even the most novice of players will be able to pick this game up with a slight learning curve. With this in mind, the thumb stick on the unit is used to maneuver Ghost Rider with the d-pad used for interaction and combat. The combat of Ghost Rider features your standard minions of hell as your plebian enemies but as you progress through the game, your enemies soon grow in power as you fight not just one but a plethora of enemies in a race to save the world. The developers have done a decent job at the artificial intelligence with your enemy almost having a human-like response to their tactic, with their combat skills gradually increasing as your progress. There are also a variety of enemies littered through the universe of Ghost Rider with your classic "boss" characters who challenge and taunt the player before proceeding to the next area. Ghost Rider also has a retribution meter that can be used to send your character into a hellish rage mode which boosts his power and assists him to challenge even the most powerful of demons. The title features a healthy dose of unlockable content that is oozing with comic fan goodness with the best feature being that once you have finished the title as Ghost Rider, you can replay the game as Blade, the half-vampire superhero. Unlike Ghost Rider, Blade features his own combat moves and weapons to really assist in the replay value. Other nifty bonuses include the ability to read a few Ghost Rider comics, provided you have unlocked the right keys in the game. 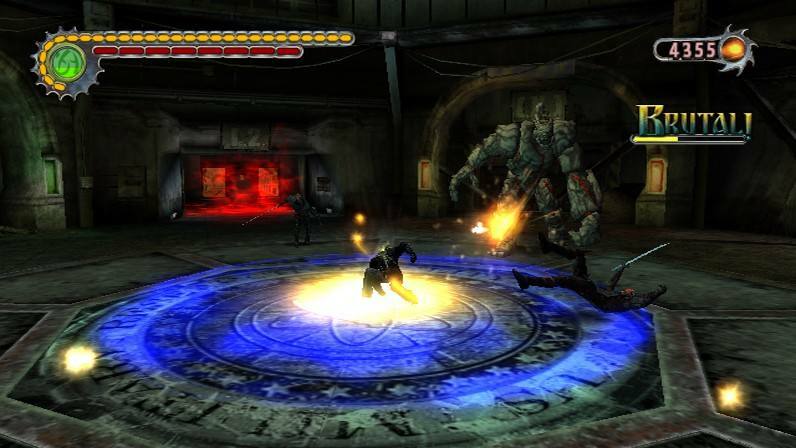 Graphically, Ghost Rider is rather visual on the PSP with highly detailed gaming environments from realistic 3D environments, detailed textures and a variety of special effects such as Ghost Rider's flaming skull to his hellfire shotgun that casts an unearthly light and shadow in the gaming world. 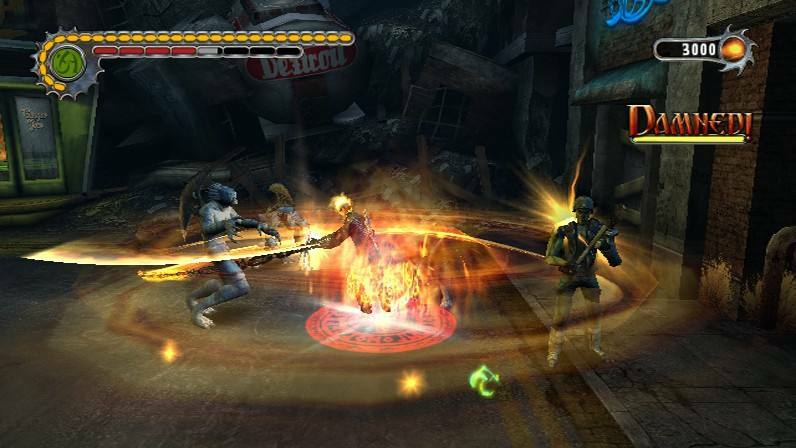 All the characters have been realistically designed that interact well with the title and in order to progress the game, the developers use comic-like cutscenes to tell the tale of Ghost Rider. Ghost Rider features a wide gamut of supernatural sound effects from the guttural roars of beasts from another world to the roar of Ghost Rider's motorcycle and the unholy "snap" of his weapon. The musical score of Ghost Rider, although ambient does not really add to the gameplay of the title and will not win any Grammy's but it's a nice distraction and does help with the entertainment value of the title. In conclusion, Ghost Rider for PSP is an entertaining and well-made game that should take most gamers around 10 - 15 hours to successfully complete. With an interesting comic-like story, sturdy gameplay and some really great graphics on this console, it also features great replay value as gamers can also play as Blade. Great stuff!